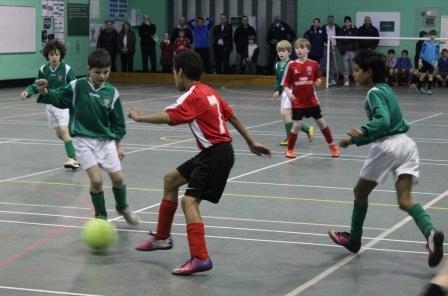 On Friday evening Westholme School hosted the final of the annual 5-a-side indoor football tournament. We welcomed back Salesbury, St Leonard’s Langho, Harris, Westholme A, Broughton and The Redeemer who competed against each other in a bid to become the tournament champions. All teams played brilliantly and the high standard of play that had been seen in rounds 1 and 2 was maintained in the finals, resulting in some nail bitingly close matches! Parents and teachers watched transfixed to the games on the sidelines. After all matches had finished, the now infamous tea of of pizza, sausages and chips was enjoyed by all in the dining hall. Mr Lewis then announced the results. Congratulations went to the winners, Salesbury, Harris who came second and to Broughton who came third. Congratulations must also go to Westholme, St Leonard’s Langho and The Redeemer who narrowly missed a medal position.